When Mountaintop Community Church in Vestavia Hills, AL approached Media Visions to upgrade its display technology from standard to highdefinition widescreen, they were expecting to simply replace an existing triple-projection, edge-blending system. 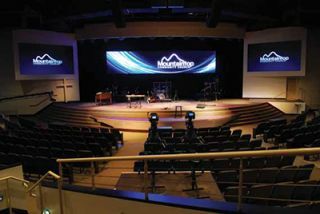 Media Visions was able to provide a more cost-effective, custom LED display solution to replace Mountaintop Community Church’s triple projection, edge-blending system.In an unanticipated turn of events, the Birmingham-based integrator was able to provide a more cost effective, custom LED display solution instead. The original challenge presented to Media Visions was to replace the two projectors flanking either side of the stage for what is used as the main IMAG, as well as the central projection screen display. Cruce noted that over the years, they have struggled to keep edge blending projection easy to use for clients, since it is more labor intensive, and lamp replacement can be a major issue between the cost of replacement and any unexpected failure. As a result, the Media Visions team began to study the mean time between projector lamp failures, how often Mountaintop Community Church used its system, and how that translated into lamp usage over time. Media Visions also researched some of the newer offerings in LED technologies, in which price has come down considerably and quality gone up, leading them to discover a 6mm LED solution that they were able to custom build to their specifications for the facility. “After two and half years, assuming there were no problems with the projectors—no matter which [DLP projector] technology we went with—after two and half years, you were done paying for LED, but still paying for the projection system,” Cruce said. “It’s not that projector technology isn’t good or doesn’t last,” Cruce noted, it was the lamp and other consumables or intangibles that led them to seek an alternative. There were a lot of considerations that went into the decision to pursue this alternative. For example, projectors would have to be flown or accessed from a catwalk or other lift system. In contrast, the Media Visions LED solution is on motors, so if anyone needs to access the screens for maintenance or other means, they can automatically take it right down to the ground. Noise was another benefit LEDs had over projection, the latter of which has audible fan noise, often right over a speaking pastor’s head. But with the LED display, the fans are behind the screens, and much quieter than that of projectors. These factors and other intangibles became tangibles for Mountaintop Community Church. “All of a sudden, the cost of ownership and logistics began to make sense to them,” Cruce said. He also jokingly noted, “We worked ourselves out of a job,” by installing LEDs, because they used to be contracted by the church for the projector maintenance. Media Visions was also tasked with performing a complete gut of Mountaintop Community Church’s AV systems, which hadn’t been updated since the mid-’80s. From there, it was a pretty standard HOW install for the Birmingham integrator. They opted to stay with projectors for the IMAG screens on both sides of the stage, since there wasn’t enough resolution in the 6mm LED wall to also do IMAG coming off cameras. They selected native HD chips on the camera, and matched them with a pair of Barco RLM-W8 projectors. Some of the other equipment installed included Ross Video RCPNKQ 17-button Q Series control panel, along with corresponding network bridge I/O cards, Blackmagic converter and extenders, Extron DA 6A audio distribution amplifier, Ross Video Carbonite 2M 16-input HD-SDI switcher, and Samsung LED monitors. Lindsey Adler is associate editor of SCN, Residential Systems, and Healthcare AV.